Meghan McCoy is a speaker, facilitator, and coach who I met through Rock Your Bliss and in today's episode, she explains how to find your core values, how to make choices from that space, and what living the values work looks like in real life. We also talk about showing up and doing the work even when it's challenging and she explains how important it is to not rush through life and instead, honor where you're at in order to collect the opportunities, people, and experiences that are meant for you. Meghan also touches on the synchronicity of the Universe, how it's guided her and she shares about her upcoming climb of Mount Kilimanjaro, and to truly trust that life is happening for us, not to us. In this episode, we also chat about following the rabbit holes of self-development that you feel magnetically pulled toward becuase those areas can awaken immense greatness for you if you choose to follow where you are called to go. 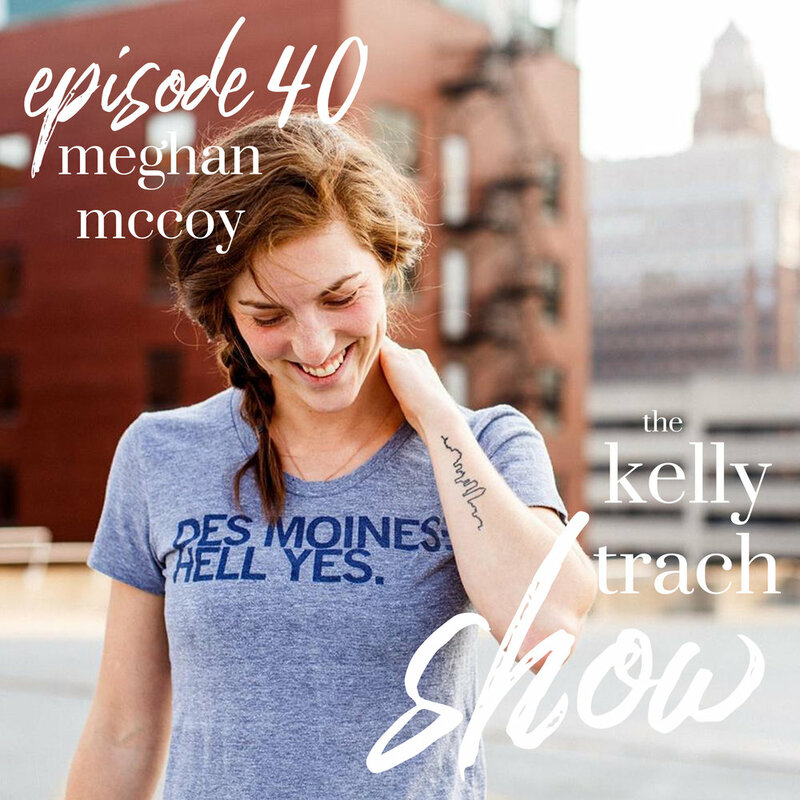 This episode with Meghan is bursting with juicy, implementable tips, real life examples, and goal setting methodologies for you to explore in your everyday life. I'm so excited to have Meghan here with us on the podcast, so tune it and grab your notebook. You'll want it handy when Meghan shares her truthbombs and nuggets of wisdom. Meghan McCoy is a speaker, facilitator, and coach. Born and raised in Des Moines, Iowa, she is the proudest Midwest girl you will ever meet. She prefers to have her heart rate elevated doing sweaty workouts with friends. And believes strongly in full bookshelves, breakfast for any meal of the day, and eye contact with other humans. Meghan has a sport background that led her to the wellness world. She competed as a college soccer player, and received her degree in Health Promotion: Wellness and Fitness Management. Her offerings are grounded in core values and real talk. Through speaking, workshops, and one-on-one coaching, she connects with individuals to introduce possibility and choice into their worlds. In addition to her own personal coaching business Meghan works as the Bliss Recruiter for Rock Your Bliss, a yoga inspired goal coaching company co-founded by Jacki Carr and Mary Beth LaRue. In her role with Rock Your Bliss Meghan works on growing the community of blisscrafters through their online programs, retreats, and workshops. It is a role grounded in connection and sharing what Rock Your Bliss is up to in the world, and she loves every minute of it! - Why you need to celebrate the little victories in life and the starting points. - How bliss comes after we do the work, show up, and go through the challenge. - How Meghan had to let go of her "shoulds" and embrace what she truly wanted instead. (+ How she has done this through self-development). - How her athletic, sweaty pursuits honor her body. (+ How her core values play into that). - How to define your own values, where to start exploring your values, and resources you can lean on. - How to pick and choose your values based on your body's sensations and signals. (+ Clueing into those winks and nudges from our own inner knowingness). - How Meghan goes for depth rather than breadth in her personal development. - Why it's important to pursue your vision. Meghan shares that: "Believing in your big life matters. It matters to you and the world and it has a greater impact than what we realize." (+ How we shame ourselves into believing that we are not enough). - How to pay attention to the things that you're magnetically drawn to and to explore them when you find them. - How life has "reasons and seasons." (+ Honoring things that have served us in the past and also choosing to let them go). - Why it's so critical to start by honoring where you are at. Meghan says: "I know I can get closed off to where I'm at because I'm just trying to get to where I'm going and I miss opportunities, I miss people, and I miss lessons. It's so important to honor where you're at."